This type of aggression is commonly referred to as “territorial” aggression; however, it is not always territorial concerns that motivate the attacks. The aggressor cat may attack only one cat in a multi-cat household and, while the victim cat is usually a newcomer, it may occasionally be a cat with which the aggressor cat has previously had a good relationship. These disputes generally arise when either cat reaches maturity at about 8-24 months of age. The aggressor cat is not necessarily the first cat that was introduced into the household or the oldest cat. 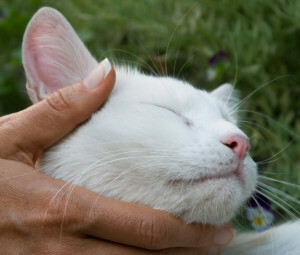 While many cat owners who experience this problem want to find a new home for one of the cats, those who have a strong attachment to both cats, may prefer to try and systematically desensitizing the aggressor to the victim cat. This is the same procedure that we recommend for introducing a new cat into the household or reintroducing two suddenly hostile cats (refer to our article “The Importance of a Good Introduction”. After desensitization and counter-conditioning steps have been taken, it is essential that the parent be prepared to carefully monitor the next very important step – their interactions once they are allowed to be together again. Any sign that an aggressive encounter may be brewing should be stopped and the cats should be separated immediately. Further attacking and fighting between them increase the hostility toward each other and becomes a learned and accepted behavior. Have a large squirt bottle handy to douse the aggressor cat when he makes a threatening advance towards the victim cat, stop spraying the cat when he backs away. (Do not shout or scold, as this will frighten the victim as well.) If your timing is perfect, he will get the message.